Maggie's is a professional pooper scooper service in Phoenix, Arizona providing pet waste removal for since 2002. Maggie's Pooper Picker Uppers is one of Arizona's true original Pooper Scooper companies. We are one of the most experienced full time professional pet waste removal companies specializing in residential and commercial pet waste removal. There is only one other scooper, also independent, with as many years and experience in the business here in Arizona. That fact alone says something about our service. Over 50+ scooper companies have come and gone over the decade we have served the valley. When you choose Maggie's Pet Waste removal you are choosing a professional pooper scooper service with a vested interest in providing you with the best pet and animal waste cleaning services in Arizona. With our service there will be no surprises. You will always know it is our company showing up and cleaning your yard. Maggie's is a true Arizona based company and our business supports our local economy. Whether you choose Maggie's, or another company when choosing your Pooper Scooper service, make sure to choose a licensed, insured, professional, reliable company. You will be sure to find all of these qualities when choosing Maggie's Pet Waste Removal. Contact us now to see how we can assist you. Pick up pet waste already scooped for HOA's, Apartments and Condos, so the dog poop does not stink up your HOA trash can. 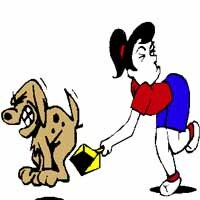 Maggie's Pooper Scoopers will give your dog or pet a treat if permissable, we make sure to shut all gates, Scoopers disinfect all tools after each cleaning, and unlike some others we remove and haul the pet waste away from your home, so you don't have to smell dog poop all week in your garbage. If you don't find what you need here contact us. We may be able to provide you with a solution to your Arizona Pet Waste and pooper scooper needs. We provide pet waste removal services and Pooper Scooper Service in: Phoenix Arizona Pooper Scooper, Scottsdale Pooper Scooper, Paradise Valley Pet Waste removal, Mesa Pet waste clean up, Gilbert Pooper Scooper, Tempe Dog Waste removal, Ahwatukee Pooper Scooper Services, Queen Creek Pet Waste removal, Chandler Pet Waste Removal, Apache Junction Dog Waste Clean up, Gold Canyon Pooper Scooper, Sun City Pooper Scooper, Sun City West, Goodyear animal waste removal, Cave Creek, Carefree, Avondale Pooper Scooper, Surprise Pet waste removal, Anthem dog waste clean up, Peoria Pooper Scooper, Glendale Pooper Scooper, Fountain Hills Pooper Scooper, Buckeye Pet waste removal, Arizona, East Valley, West Valley, as well as anywhere in between. We provide pooper scooper service for residential, commercial, multifamily, apartments, HOA, Hotels, Dog Parks, Parades, and pet events.